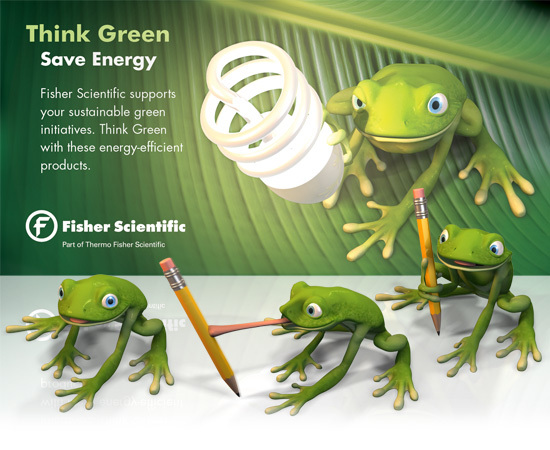 Fisher Scientific wanted to launch a Think Green campaign and mini-site for Earth Day back in 2009. I worked with one of the Research Division product experts to create a 3D From from a logo that they were already using. Once the frog was complete and approved, I created a pose library for use in print, PPT slides, the mini-site, giveaway mouse pads, giveaway wallpaper and giveaway screensavers. We even used this frog on a Think Green display for or massive trade show booth. I have the model rigged up for easy movement of the eyes, body, throat puff, and some fun tricks with his tongue.